Production of tea has suffered due to rising temperatures in Assam. The north-east Indian state grows more than half of the tea produced in the country. Last year it produced 590 million kg of tea while India’s entire production stood at 1,126 million kg. “In June temperatures shot up over 40°C—normally it ranges between 30 to 35°C,” said D P Maheswari, chairperson of the Tea Research Association and owner of Jayashree Group. “High temperatures result in stunted growth of the tea plant. There might be a 10-15 per cent crop loss for the month; what is more damaging is that the 2nd flush is top quality tea,” he added. Production during first flush in Assam, between March and mid-April, was effected due to near drought situation in districts like Jorhat and Golaghat. Production went down by over 20 per cent, said Maheswari. Quality of Assam tea, known for its strong and bright liquor, also suffered due to the rising temperatures. Data from the India Meteorological department show scanty rainfall in Assam—a deficit of 66 per cent compared to the normal—between June 1 to 19 this year. Interestingly, the last two decades saw a surge in small tea growers in districts of upper Assam. Due to rising temperatures and erratic rainfall, farmers in Lakhimpur, Sivasagar and Jorhat districts gave up on the production of the indigenous muga silk—prized as the golden wild silk worldwide—and replaced it with tea plants. 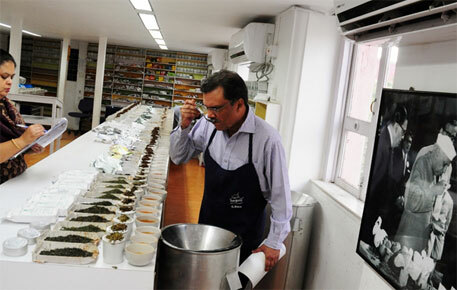 Overall, India’s tea production has gone up from 966 million kg in 2010 to 1,126 million kg last year. This is due to small farmers moving into tea production and bringing more area under cultivation, says Arun Singh, chairperson of the Indian Tea Association. “The prolonged dry spell in Assam has disturbed the flushing pattern. What is more worrying is dry heat which peaked at 48°C this June. Without the requisite humidity and temperature, tea bushes fail to respond. We missed out on the succulent good leaves of the 2nd flush this time,” he adds. "Frequency of extreme weather events have increased in the last 30 years," continues Rajiv Bhagat, deputy director at the Tocklai Experimentation Station of the Tea Research Association. "Trends show rainfall has declined by 200 mm over the past 90 years in Assam. Both minimum and maximum temperatures show a rising trend with an increase of over 1.5°C in the past 90 years." "Climate change triggers disease and pests in the tea plant and affects its nutrient uptake. Tea plants have a wide growing amplitude and can adjust to changing climate- but we are unsure for how long; so at Tocklai we are doing controlled studies testing varieties of tea plants for future climate scenarios," adds Bhagat. In June 2013,Upper Assam recorded 37 degree C day temperature for 4 days .It is abnormally high temperature for the Upper Assam Region.Tea shoot growth is severely affected. In general,after 35 degree C the tea plant slow down the photosynthesis process or even stop the process. Tocklai study in climate change will help to find out the adverse affect of high temperature in tea productivity.